Dubbo Hospital’s redevelopment will provide new and revitalised facilities to meet the increasing demand for health services in and around the Dubbo region.Stages 3 and 4 of the redevelopment will deliver a new emergency department and short stay unit; new medical imaging unit; new critical care floor comprising a coronary care and stroke unit, intensive care unit and cardiac catheter laboratory; new medical imaging unit; new ambulatory care unit; expansion of the oncology unit; new entry and drop-off zone; upgrade of the women’s and children’s community health services; and additional car parking. Working with Hansen Yunken and HDR Architecture, KRGS doors will install custom made Counterline roller shutters and Series II aluminium roller shutters to the new works. The new doors fit the requirements of the HDR and Hansen Yunken to meet the needs of NSW Health. KRGS Doors are proud to announce they are now a preferred supplier for the Coles Group for Roller Shutters and folding closures. Our doors can be seen on the store Shop fronts, loading docks, Coles Express Petrol Stations and internal storage areas such as bin rooms.On 9 April 1914, G.J. Coles opened the first Coles store in Smith Street, Collingwood, Victoria.On the day of opening, the window displays promised: 'Nothing over 1/-. 'The first day's sales were a good indication of things to come and after ten days of trading takings stood at 935 pounds, 4 shillings and 1 penny.It is great to see an Aussie brand still around for so long. KRGS Doors are proud to be associated with such an Icon. KRGS Doors recently won the contract for South Village at Kirrawee. Be delighted by the best of Sydney’s Sutherland Shire. Located in the hub of Kirrawee’s residential and commercial precinct, South Village offers a vibrant, integrated community atmosphere with the benefits of luxury living. South Village is a metropolis of community living built in one of Sydney’s most iconic locations. Enjoy unrivalled proximity to key commercial and retail precincts at your doorstep and be part of an integrated community that has so much to offer. 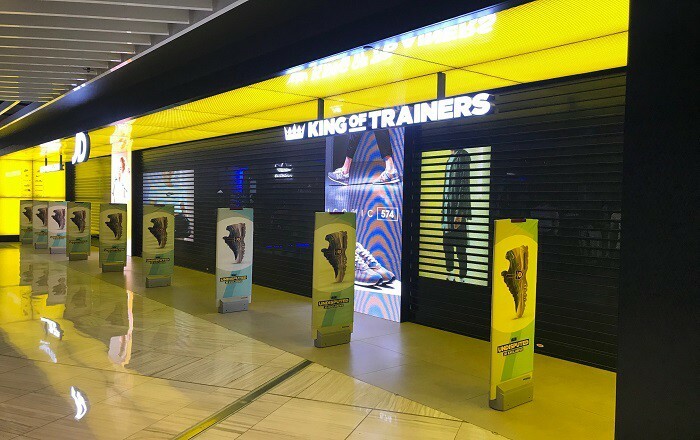 JD Sports, UK’s sports brand is now in Australia with KRGS Doors opening up their store at Miranda, Parramatta, Macquarie Centre and soon to open Penrith.